If it’s January, it’s time for IDS Toronto. 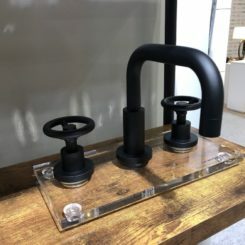 We at Homedit adore this show because it is our first real look at the design trends for the coming year and the types of products that will be showing up in homes. 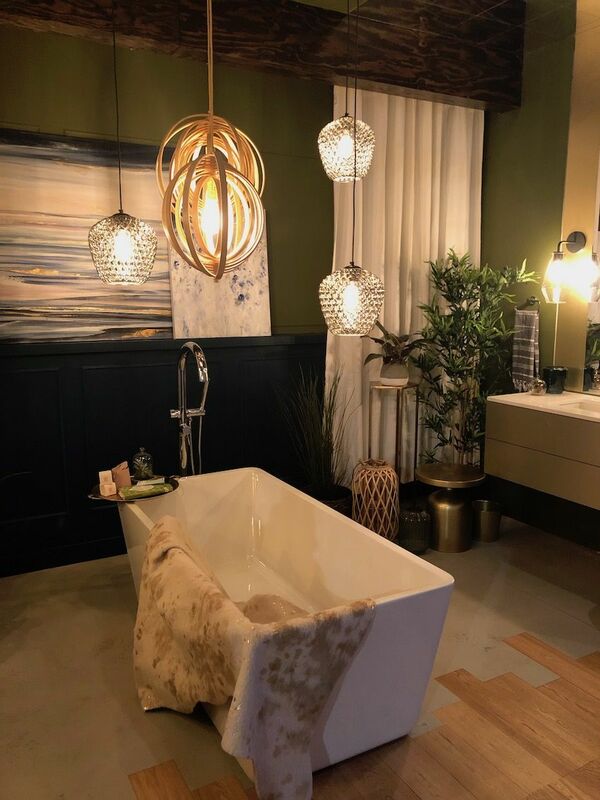 The 2019 show was bigger and better than ever, with a separate new contract division for businesses, which provided plenty of great ideas for styling a home too. 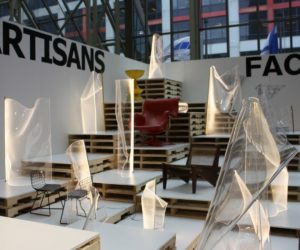 From the big, creative installations to the small maker pieces in the “Studio North” section, here are some of our favorite finds from IDS. This small structure is remarkably comfortable. The Backcountry Hut Company created this installation of a full concept house that is built with a “kit of parts” for building small structures. 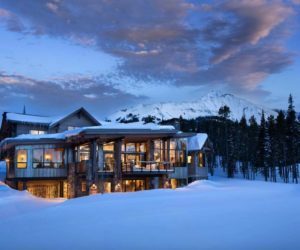 The company says it is a “modernist interpretation of the notion of rustic wilderness living base on the spirit of Canadian outdoor culture. 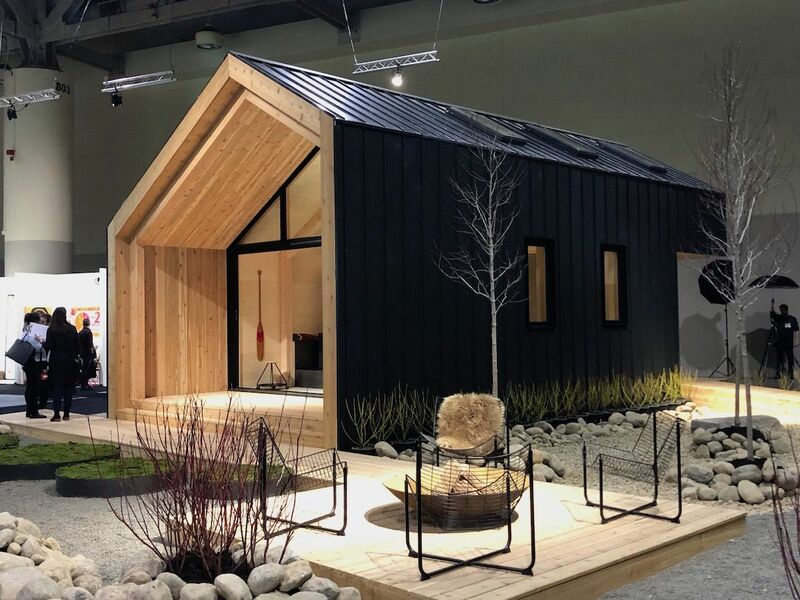 The developers say that it can easily be customized for any location, from a remote back country area without plumbing to a more vacation-like “front country” cabin. The interior is comfortable and cozy, with a sleeping loft, bathroom with a shower and full galley style kitchen. Conjoining and circle and an oval create an innovative space. 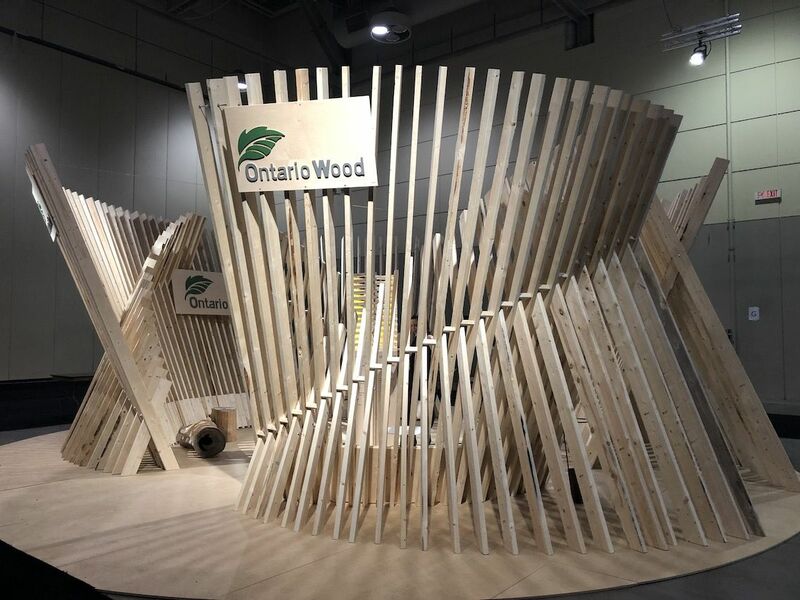 Ontario Wood always presents an innovative structure to highlight the area’s great natural resources and this year’s installations was conceived and built by architecture and design studio Izen Architecture. 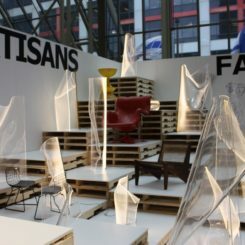 Their idea for this year’s work focused on forms that are easy to build, dismantle and relocate. It uses “conventional building methods to reimagine a modern sense of gathering and community using standard lumber.” The shape itself is an oval conjoined with a perfect circle, which creates two elongated conical forms with the gathering place in the middle. Stepping inside is a bit like gathering around a campfire. Diamond mirrors add flair to the sophisticated vanity. 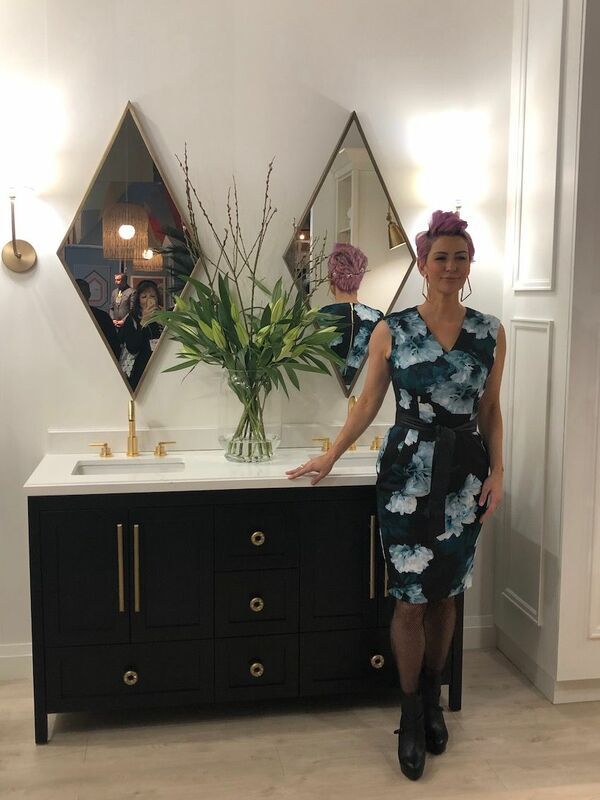 The bathroom designers at the show always have some great innovations and this year, we ran into Canadian interior designer and social media influences Amanda Forrest. 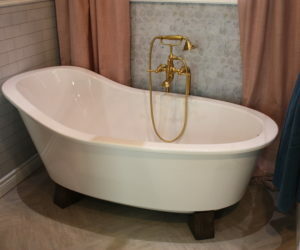 Forrest teamed up with Dezign Market to present a gorgeous bathroom design with super clean lines. Dark wood cabinetry paired with a light color vanity top are accented with sophisticated gold hardware and fixtures. The diamond-shaped mirrors at the vanity are an unexpected and very stylish option. 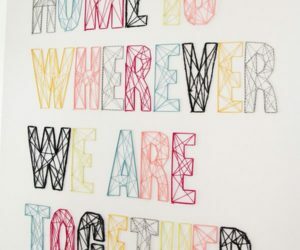 A quirky wall mural is a big statement in the bathroom. 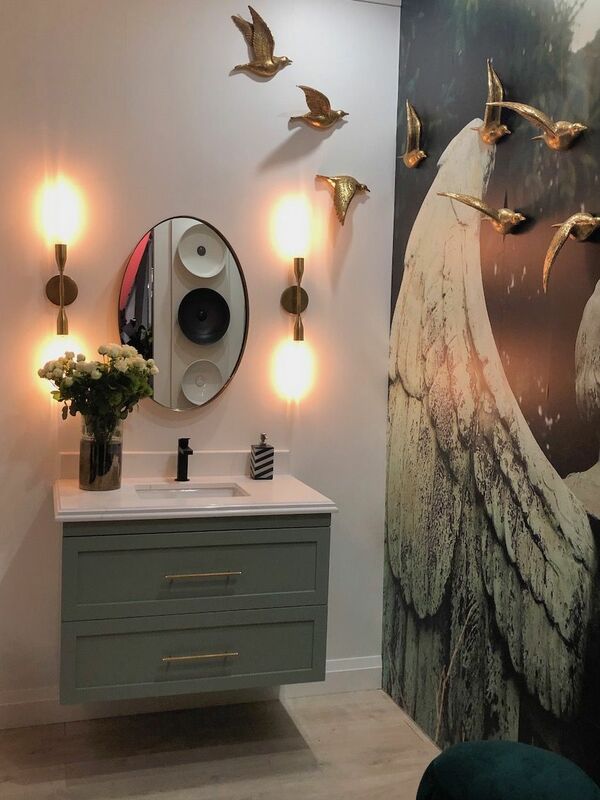 Forrest also designed this fabulous powder room that features a wall-sized mural of a weathered, old angel statue — the sort found in a cemetery. 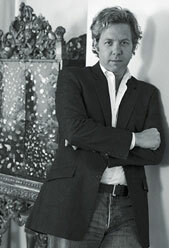 A muted shade of green covers the vanity and is also present in the mural, tying them together. A flock of birds in flight span the walls from near the mirror, across the corner and onto the mural. This is a daring but extremely effective decor trick for melding the elements together. Another gorgeous bathroom is this calm and serene design, done with deep, mossy green walls. The hue adds a feeling of earthiness, which is enhanced by the stylish pendant lights. 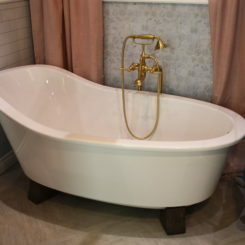 Set directly over the tub, this type of bathroom design truly makes the soaking tub the focal point. Its location in the middle of the room also makes it the star attraction. Adding accessories and plants to bathroom also transforms it from a stark and functional space to a warm and welcoming one. 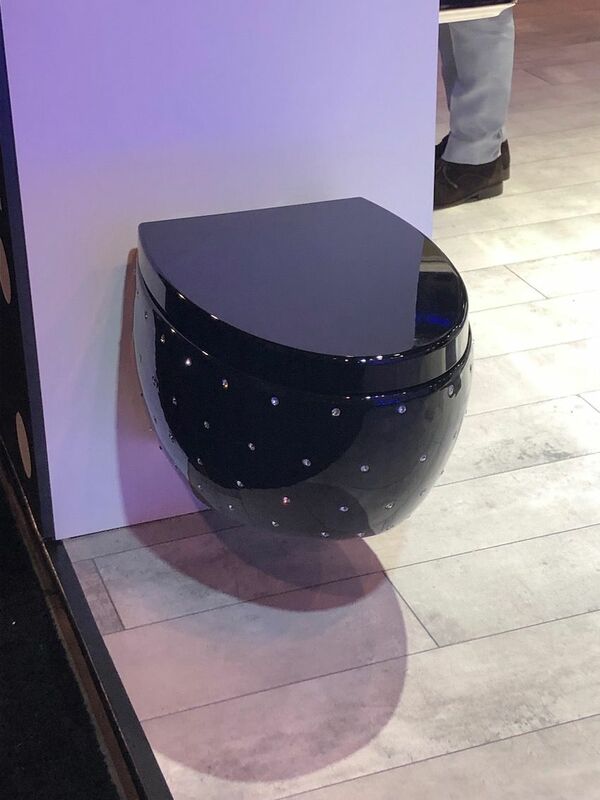 This toilet will appeal to those who like a little bling in the bathroom. Nothing says “over-the-top” like Swarovski crystals, and now they can adorn your toilet too. This blinged out black model was shown by PierDeco design. 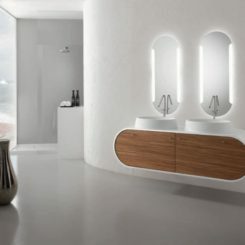 The hidden tank style is very modern and streamlined, which also makes the crystals really show on the black porcelain. Of course, the toilet has a matching sink to really add an opulent edge to the bathroom. Tile innovations make a rustic shower surround possible. At the other end of the design spectrum, Zitta presented a shower with walls that will appeal to those who prefer a more natural vibe. What looks like a natural wood wall is actually a tile that will fool anyone until they touch it. 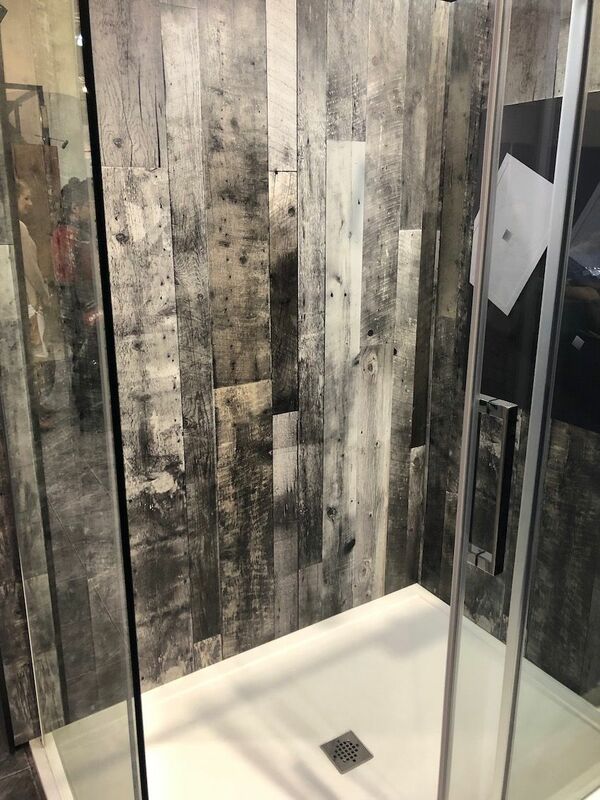 The textural variations in the boards, complete with flaws and knots, are very realistic and add a rustic feeling to the otherwise modern shower shape. Customizable lamps with paper shades are a true winner. 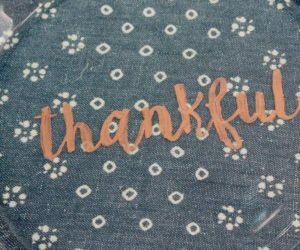 Studio North & Prototype is a favorite section because of all the innovative, hand-crafted pieces found there. 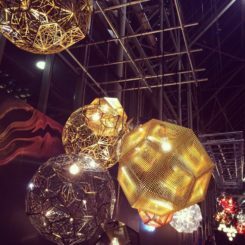 Artisans from all over Canada and some from other countries show off amazing talent with their custom work and limited-edition collections. The exhibits here are fascinating, and Zeed Ventures was the booth winner in Studio North for 2019. The Tapermoon Skylight floor lamp is very different. 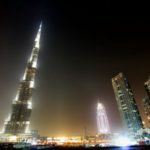 Because it uses LEDs, the individual pieces of the shade are actually made from paper, which can be stacked up on the main post, that houses the light source. 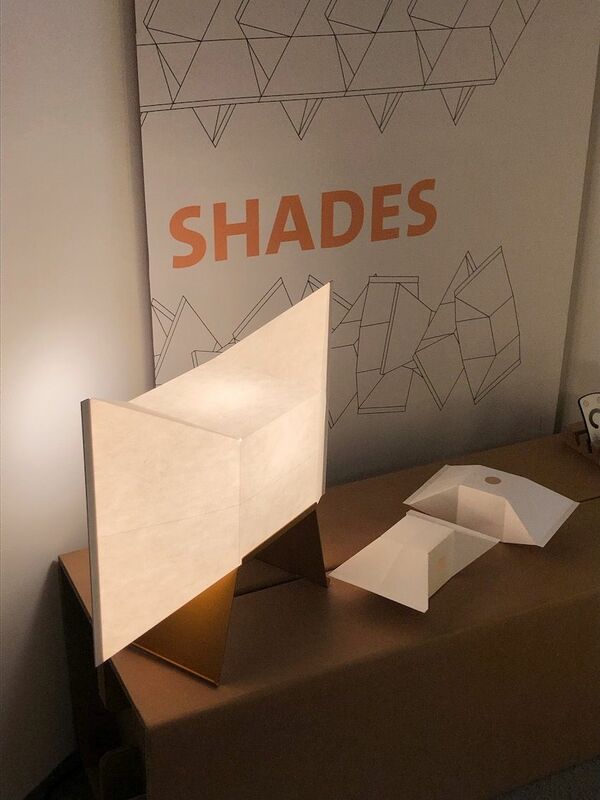 Larger individual paper shades can be used for a small lamp. Ingenious! This glamorous chair is very eye-catching thanks to its shape. 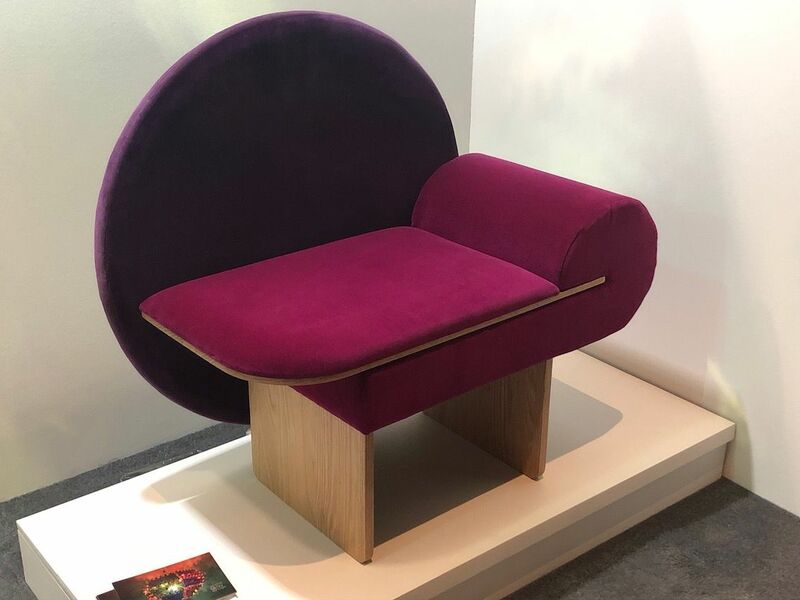 A marvelous vanity chair by Vako Design of Iowa City, Iowa has a definite Art Deco vibe and is said to also be inspired by the Memphis Modern era. The plush velvet in rich colors is the perfect upholstery choice for the sensuous rounded shapes. 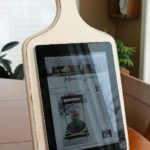 The simple wood frame, which is visible throughout, strikes a perfect counterpoint. Besides being very attractive, this chair is quite on trend with its velvet upholstery. 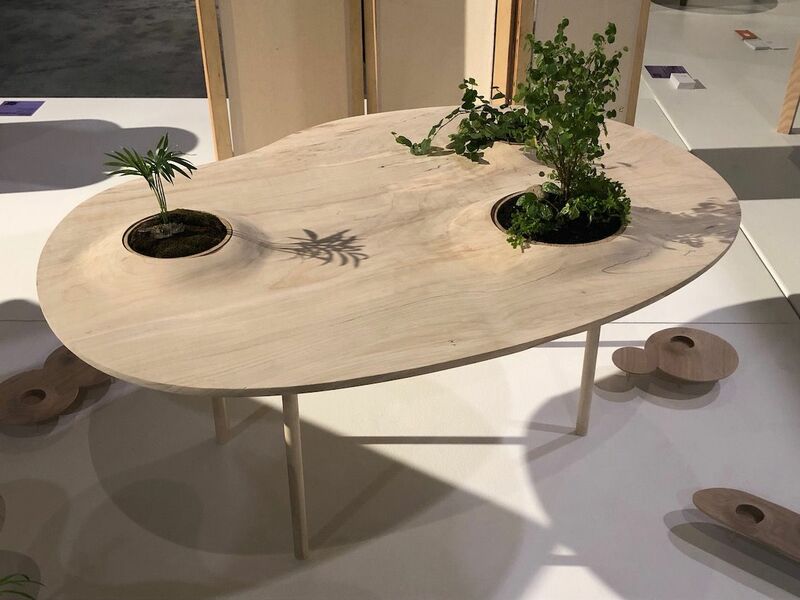 Almost like a landscape, this wooden table by WooYoo gives the impression of sitting by a natural area. Called the PokoPoko, it adds dimension to what’s usually just a plain flat plane. The raised areas act as little gardens of green space and create a relaxed spot to enjoy some tea and conversation with friends or family. Versatile furniture works for an office or home setting. 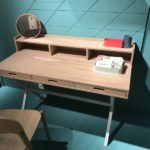 Among all the pieces designed primarily for office and other business environments, we found great pieces that are ideal for home as well. In the NUA Office booth, this grouping snagged our attention right away. 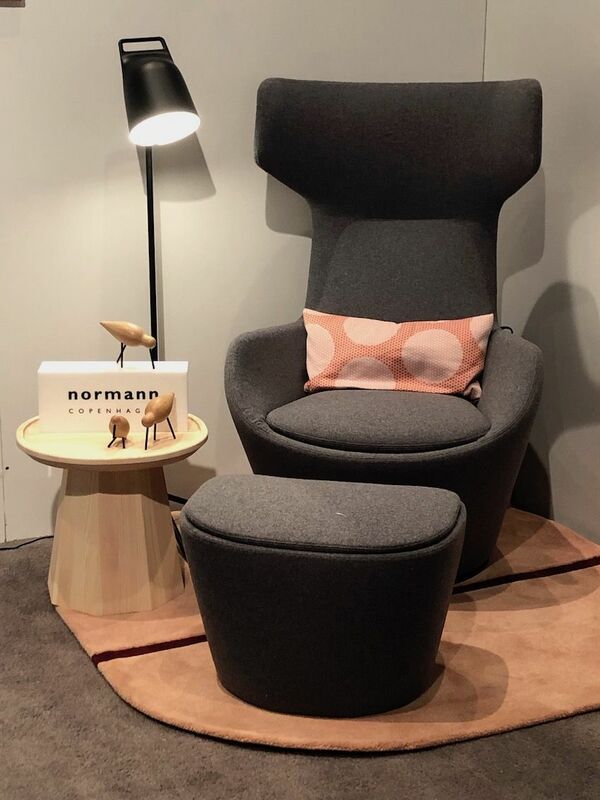 Perfect for a reading corner in the family room or as a seating area in a home office, the chair and footstool have a Nordic vibe that is very versatile. From Norman of Copenhagen, the pieces are also durable as well as comfortable. 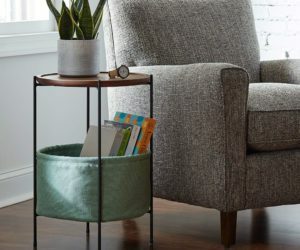 The charming little side table is also ideal for almost any space. Eclectic elements can make a very sophisticated living room. 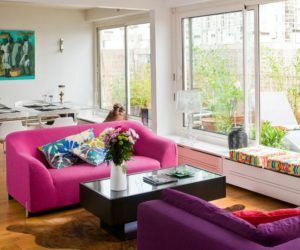 When it comes to stylish modern living rooms, Roche Bobois puts together an environment like no other. This collision of prints on the floor and the wall, accompanied by earthy hued seating and vibrant occasional tables creates an eclectic room that is hard to define — except to say it’s phenomenal. This space is also a lesson in how to combine wildly different prints and a divergent range of colors and finishes in a sophisticated way. A retro cabinet works perfectly with the bold mural. This vignette in the booth by Cardinal Fine Cabinetry and McKaskell Haindl is the perfect combination of retro and modern. The street-art-style mural on the wall pairs nicely with credenza that has a rounded shape and stone top. Floating shelves add storage without hiding anything much of the artwork. Doggies deserve a quality bed too. A pooch needs some stylish new furniture too, and Slumberwolf has custom dog beds like this one that feature a natural wood frame and woven rope support in the base. Designed as a spin-off of beds used by the family, the artisan decided to create them for dogs as well. 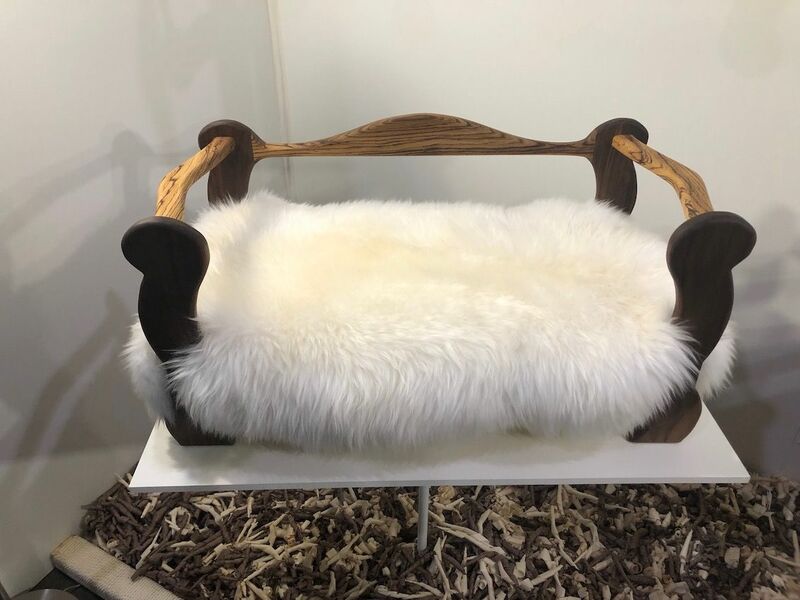 The company notes that many luxury dog beds just miniature versions of a human-size foam-filled sofa, but these are handcrafted pieces of furniture that can be displayed with pride. These lights have a fairy-like, forest quality. 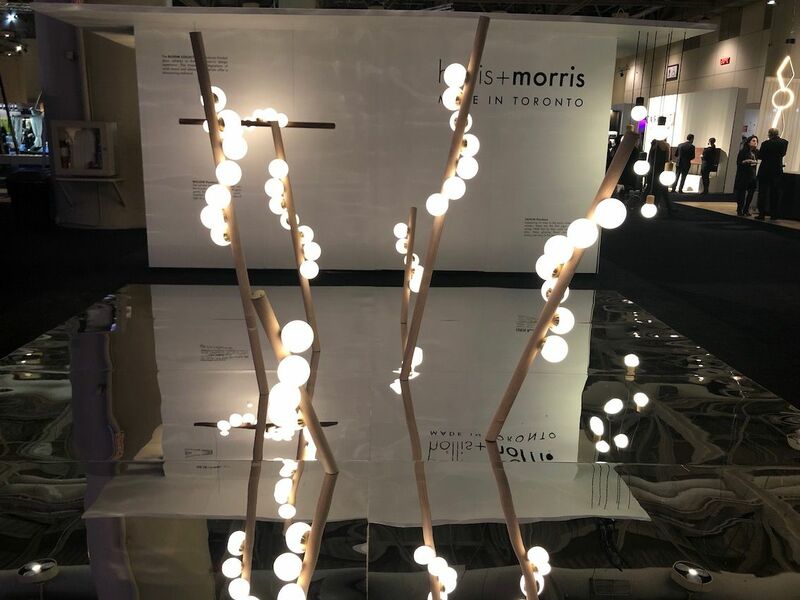 Hollis + Morris is a favorite booth every year and 2019 certainly did not disappoint. A floor version of their willow pendant looks like stems of luminous trees growing out of the ground. More than just a stunning display, the fixtures are perfect for creating a natural ambiance in a room, with the globes gently forming an arc around the central post. The delicate pattern is typical of the lingerie designer’s style. 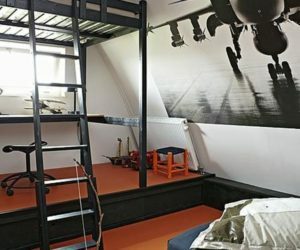 Barrisol is a company known for its “stretch ceiling”, which is a non-flammable sheet PVC sheet that is tightened under the effect of heat on the periphery of the walls thanks to a patented track system. 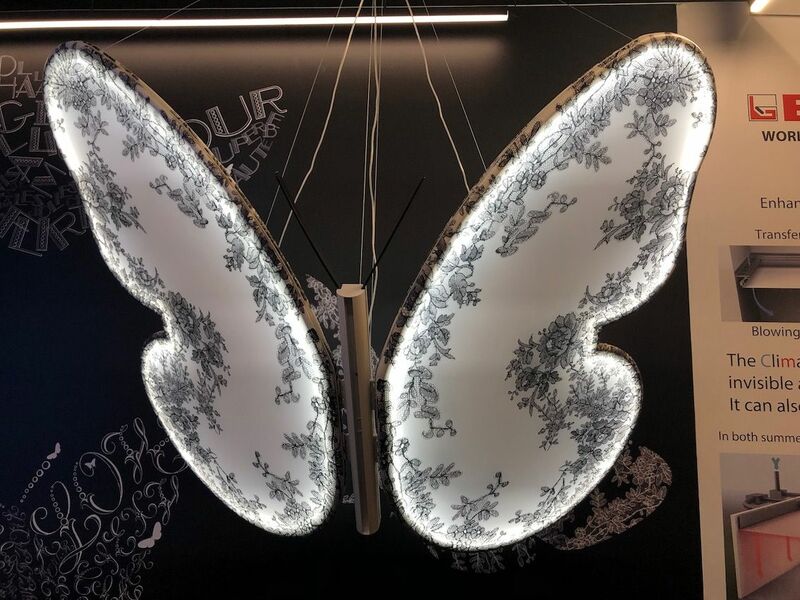 Using that material concept, the company presented this stunning, delicate Butterfly by French lingerie designer Chantal Thomass. The suspended luminaire is sleek and subtle, with light coming through the canvas that is stretched over the aluminum frame. 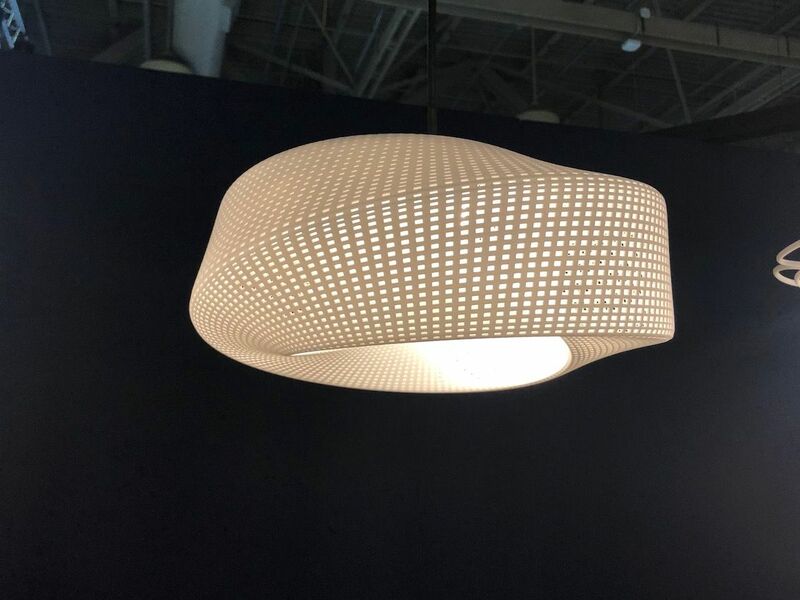 3D printing can now yield larger, more complex lighting fixtures than it used to. Fashion designer Zac Posen has teamed up with Monogram Canada. Monogram of Canada turned to renowned fashion designer Zac Posen for a collaboration that yielded a custom designed column refrigerator panel, which can be seen behind Posen. Inspired by how clothing wraps around the body and how different shapes move around, the panel shows how artful everyday appliances can be, which fits right in with Monogram’s new “Elevate Everything” campaign. 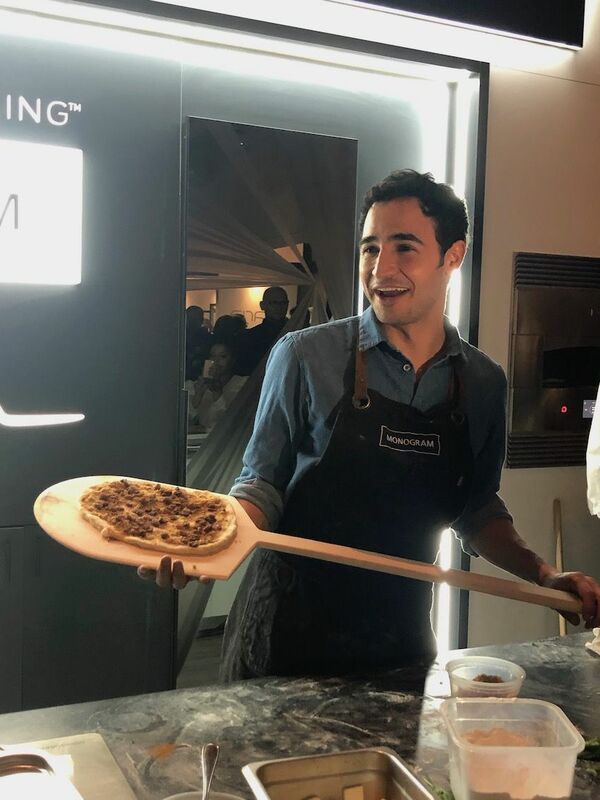 And yes, Posen made pizzas on site at IDS in the company’s ventless electric indoor pizza oven. 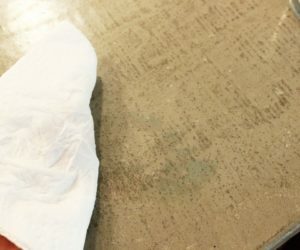 This durable sink has the look of concrete with easier care. When it’s time for clean-up, Blanco has a new farmhouse sink that looks like concrete but is actually made from BLANCO’s SILGRANIT material. 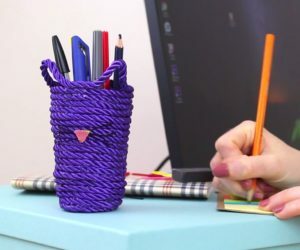 which is cleanable, colorful, and very durable. 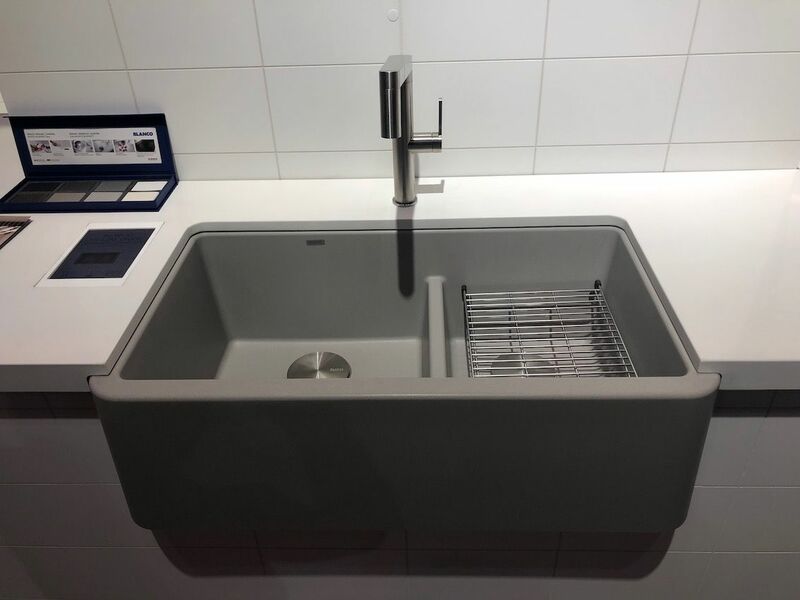 The IKON sink comes in eight shades and three sizes, including one for smaller spaces. Another great feature of these sinks is that they can have a single bay or be divided, as is the one above. 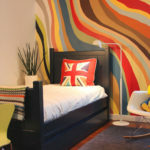 French street artist Kongo painted six La Cornue ranges. 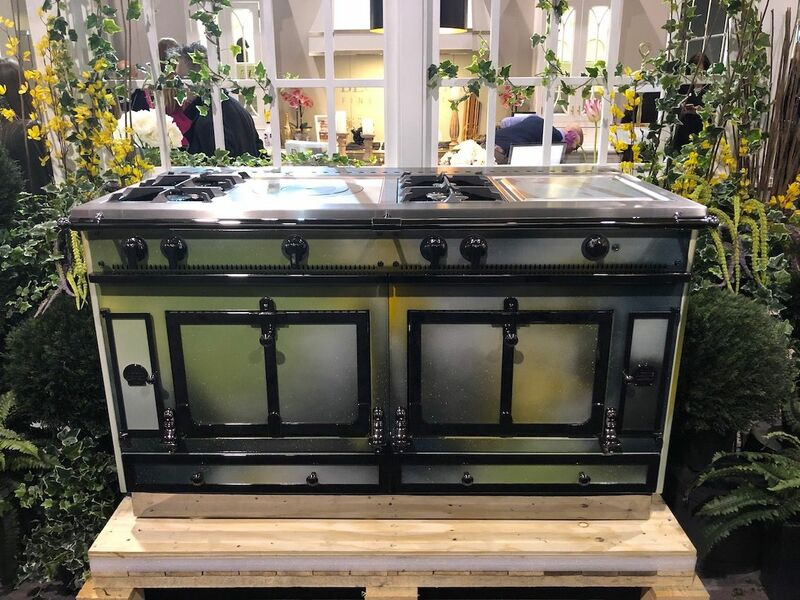 La Cornue is already known for exceptional luxury in the kitchen but a limited edition of six specially painted Chateau ranges brings things to a whole other level. 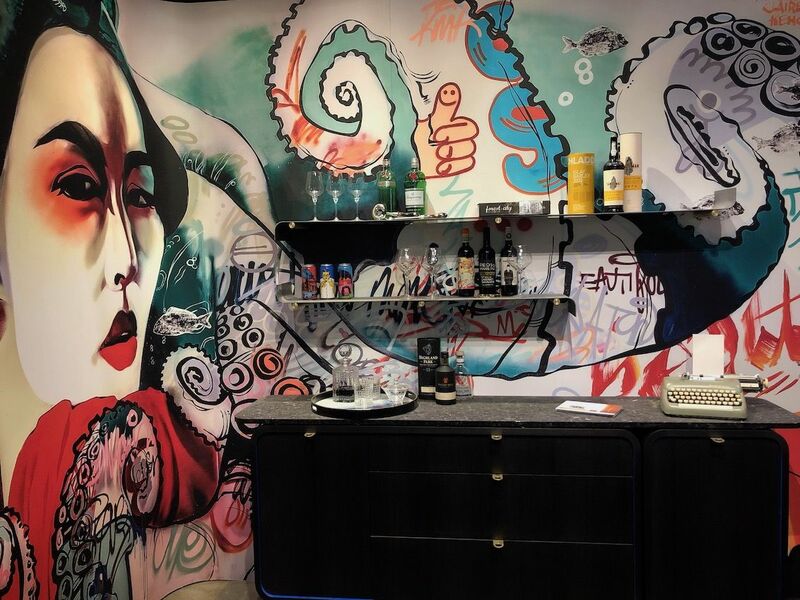 Hand-painted on all four sides by French street artist Kongo, each of the six are different and truly works of art for the kitchen. From these green hues, to more pink and coral shades, and two models done in a more typical graffiti style, they are unlike anything you have seen. 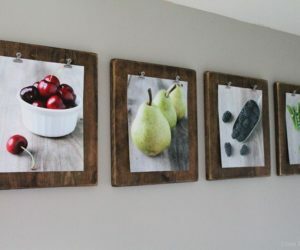 Since all four sides are painted, the back panel could be removed and hung as a second work of art in the kitchen. This Chateau range was presented by Bloomsbury Kitchens. Connectivity and integration will be big for kitchen appliances. 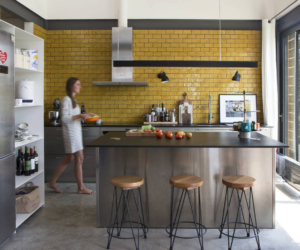 Setting aside artful appearance, the overarching trend for the kitchen is technology integration and connectedness. 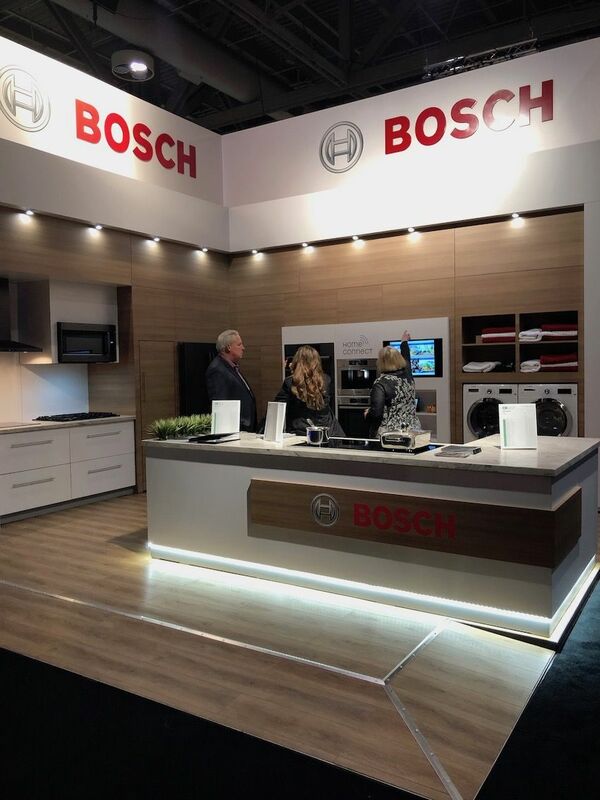 Most all the brands, including Bosch, are showing kitchen appliances that can be controlled and monitored via smartphone or tablet device. From being able to start your dishwasher while you are at work, to programming all your guests’ favorite coffee drinks for the next dinner party, the possibilities are mind-boggling. According to Bosch representatives, the most technically advanced appliances will soon be able to integrate via a common platform, no matter what the brand. The popularity of wood flooring shows no sign of waning. 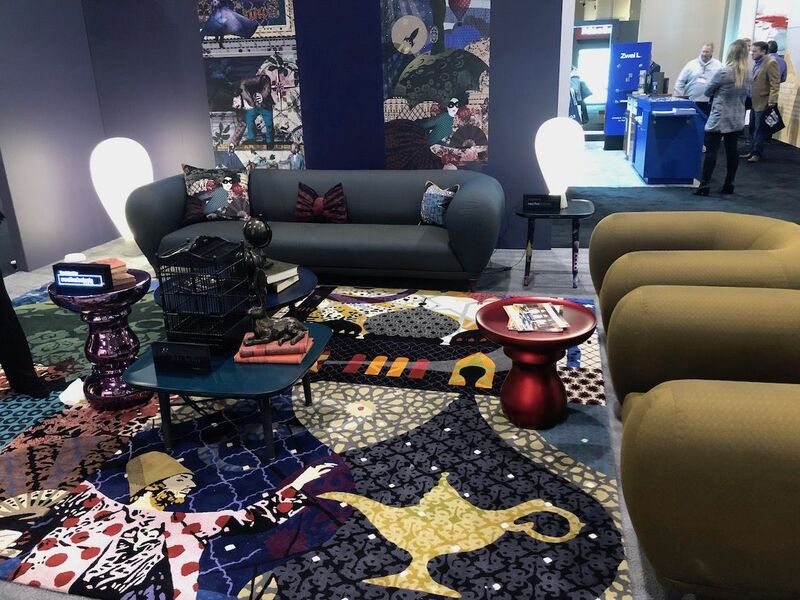 Sculpted carpeting has come a long way from its early versions. 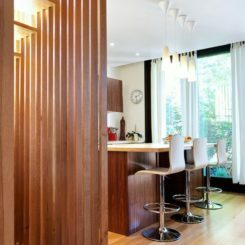 Wood floors are still wildly popular and show no signs of slowing down. 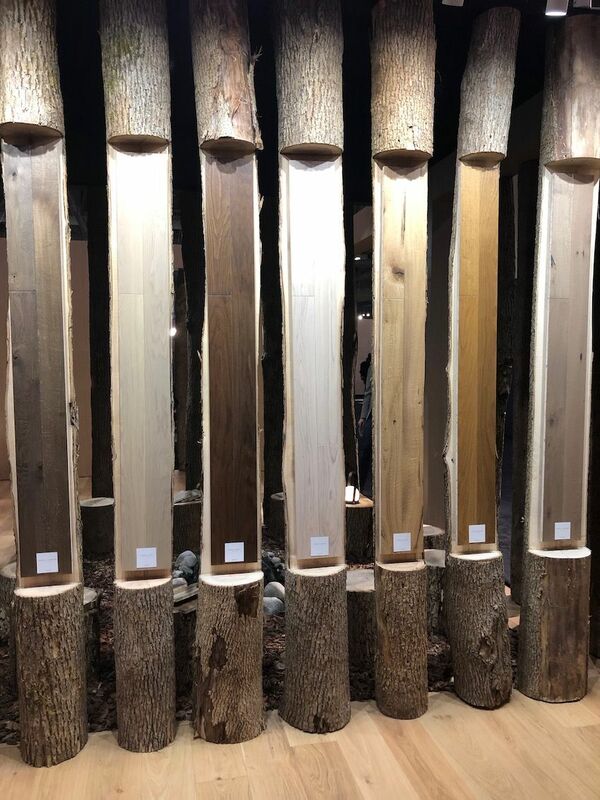 IDS sponsor and wood flooring manufacturer Pur Parket had the most imaginative way to display the sample of their wood flooring: On the sections of trees from which they come. 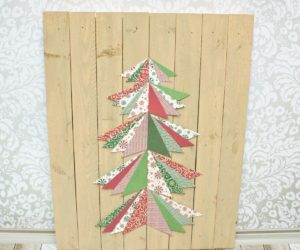 New releases in lighter shades are becoming more popular and rustic selections also remain best sellers. The company also carries a vinyl flooring that looks like wood, which could probably fool even the most discriminating customers. 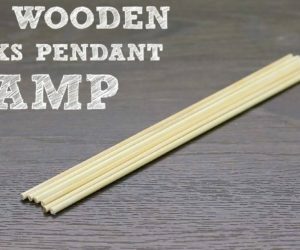 Pur Parket’s representatives say that the vinyl is a good option for those who love wood but don’t have the budget for the real thing. 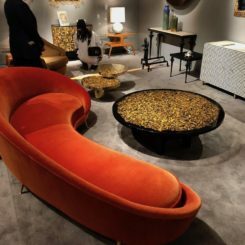 It used to be that the mention of sculpted carpeting would conjure up images of the old 1970’s low-pile rug with amoebic channels running through it. Boy, have designs come a long way. 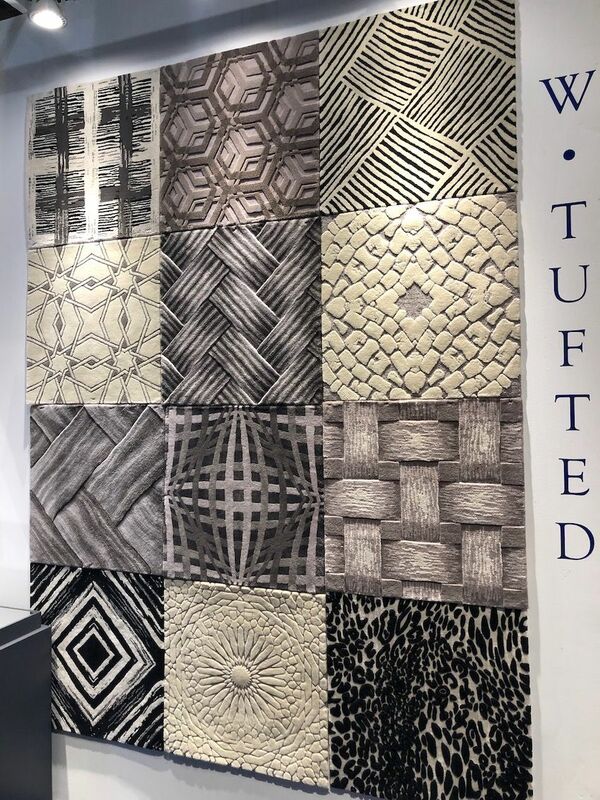 These sculpted offerings from W Tufted are a far cry from the early styles and offer so much texture, movement and artistic flair that they are hard to resist. Geometric shapes combined with color shading and the sculpting come together in some very sophisticated carpeting. Beauti-Tone’s color display was super creative. We can’t talk trends without addressing colors. 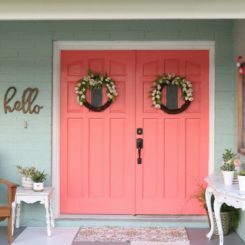 For 2019, Beauti-Tone’s color of the year for Canada is Tropic of Conversation, an earthier version of the Coral color that Pantone released for the US. 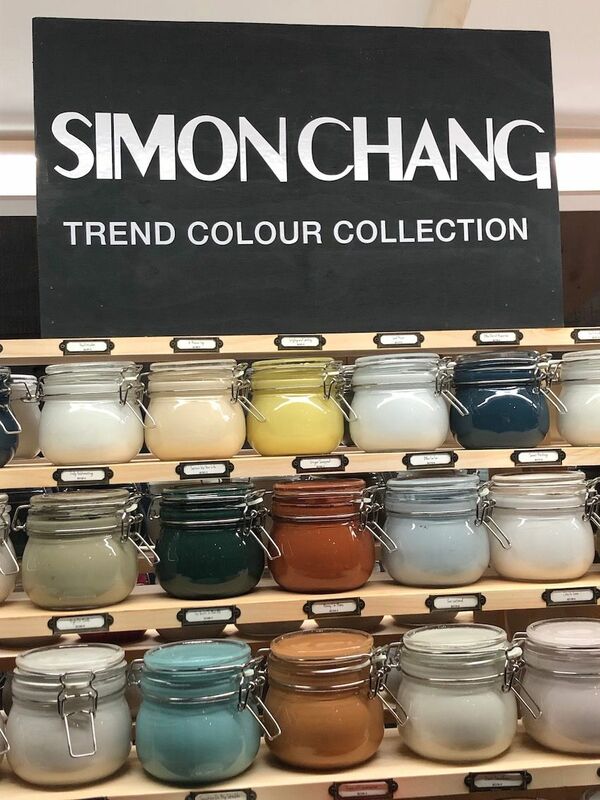 The hue of the year is part of the collection created by internationally acclaimed Canadian fashion designer Simon Chang. Chang’s fashion-forward collection of colors is perhaps a little bolder than usual, but is definitely user-friendly. 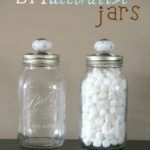 Besides, we love the way all the BeautiTone color collections were displayed in country-style jars. 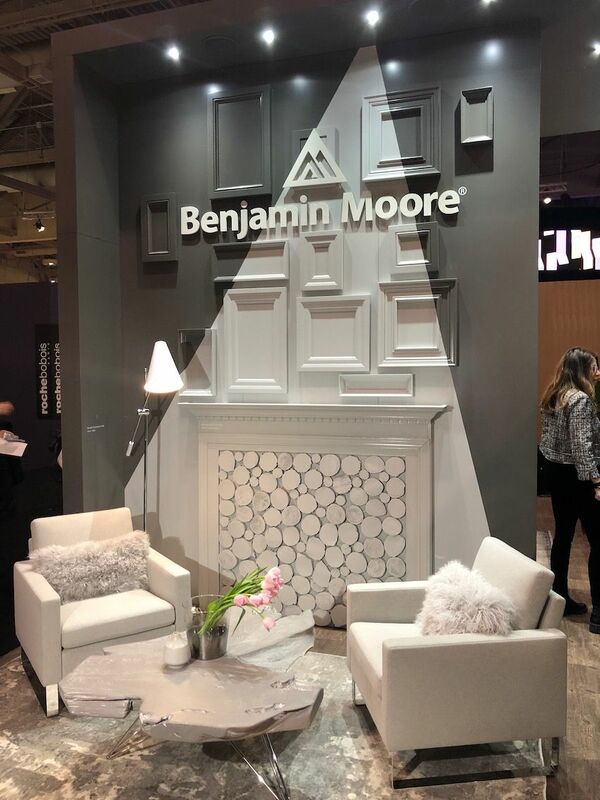 Benjamin Moore went for a neutral hue for its 2019 color. 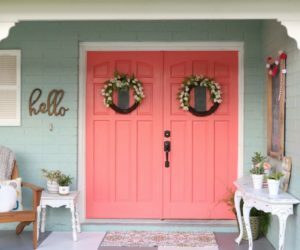 In a totally different take, North America’s Benjamin Moore, showed its Color of the Year for 2019, which is called Metropolitan. AF-690 is a stylish gray with cool undertones and mixes well with neutrals, as in this display. 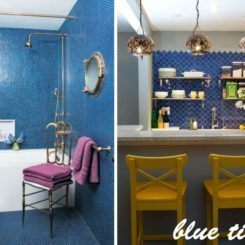 The company said that their choice is neither “arresting nor aggressive” and is an understated, glamorous hue that contributes to serene ambiance. 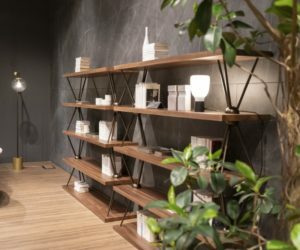 With more than we can possibly share in one story, IDS Toronto 2019 was loaded with new ideas for all the rooms of your home. 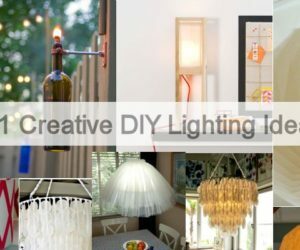 Keep an eye on Homedit for more ideas from Canada’s best designers and brands for the coming year.